When you come across an especially promising local variety of a crop grown in your area, how can you enable other farmers to try out this variety? If a farmer gives you 30 seeds of an exceptional variety, how might you go about distributing these? How does seed flow happen in and among communities where you work? In this article, we share about ECHO Asia's experience helping host four very different seed fairs. We also outline several important components of a seed fair, so you can learn from our experience if your organization is interested in hosting one. An important activity of many ECHO network partners is supporting farmers in locating, testing, and distributing plant varieties that grow well under local conditions. C rops and varieties that can produce reliably with locally accessible inputs are essential for smallholder farmers. Most farmers in the ECHO network produce and save much of their own planting seed, and some are in a transition time with using commercial seed for certain crops. Understanding farmer seed access, supplies, and practices is a critical part of improving local farming systems. 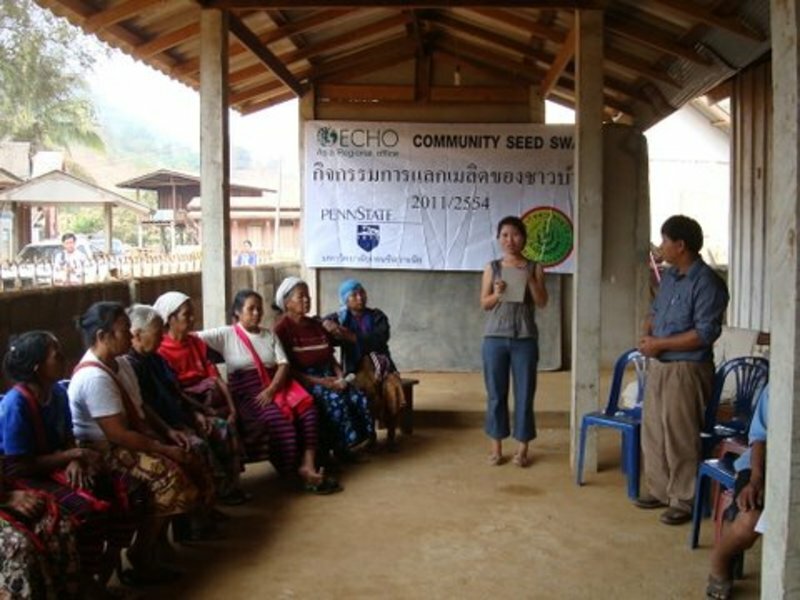 In 2010-2011, the ECHO Asia Impact C enter and partners (2) conducted three months of seed systems research in three village clusters in northern Thailand and Cambodia. In each location, the research culminated in a seed fair, in which participating farmers gathered to learn about each other's varieties and to exchange seed with other farmers. We also helped host a fourth seed fair in India. The fairs provided us an opportunity to learn more about facilitating farmer-to-farmer exchange of local vegetable varieties. In each of our seed fairs, farmers and other visitors saw some varieties and semi-domesticated species that they did not recognize, or that they thought were extinct from their region. Through our experiences, we learned about several important components of holding the seed fairs, outlined below. 1) Together with farmers' groups and local leaders, decide on a few simple objectives of your seed fair. Then consider how your location, timing, invitations, and event planning can support those objectives. What is the main message you want all participants to take home with them about local crop biodiversity, farmer-produced seed supplies, or other topics? What are the current local conditions of farmer seed-saving and biodiversity in farmers' fields, and what influences are driving agricultural change in your area? What interactions do farmers have with the commercial seed industry? Are there local needs around specific crop types or agrobiodiversity education to prioritize in your region? Is your organization also using the seed fair to learn about (research, record, and/or collect) the range of local varieties that are still being grown? How does that fit into the seed fair? What role (if any) will local government and agricultural agents have in the fair, and what do you want them to learn about farmers' biodiversity and local varieties through their participation? Would speeches, small-group discussions, games, songs, drama, formal or informal education, or farmer presentations best meet your main learning objectives for the event? Be creative! 2) Choose a forum and participants. Each fair was held in a different context, ranging from a meeting of NGO staff involved in agriculture, to subsistence farming villages, to communities linked to commercial agricultural systems. The first seed fair was added on to a regional NGO meeting, and the others were stand-alone events, with other educational components included. Hosting a seed fair in a place when your expected participants are already gathering for another cultural, religious, or commercial purpose can make it more affordable and accessible for them to attend. This can also build the local seed network, as farmers may later contact another farmer they've met for additional seeds or information about a crop. More women than men attended and brought seed to the fairs, likely for two reasons: our earlier research had interviewed women's groups and emphasized their important contributions at the seed fair, and we held the villagebased events in locations where women could easily travel together. Strive to ensure that sufficient diversity will be present among seeds brought to the event. The most productive seed and knowledge exchanges among farmers took place when farmers brought seeds to share from more distant areas; within one very close village cluster seed fair, farmers found less interesting variation from what they already had or could already access on their own. However, bringing together people from a wider area adds challenges in allowing for transportation time and expense, and in providing for language translation among different ethnic groups. Consider what exchanges in crops, growing zones, and other factors might be most valuable in your region. Inviting officials, agricultural extension officers, and other NGO representatives allows them to learn about local farmer crop biodiversity. Such people who attended each of our seed fairs expressed significant surprise at the range of seeds brought by farmers, and this is an excellent opportunity to advocate for policies and programs that support rather than diminish crop diversity. However, the organizers must ensure that the expected time given to such guests for speeches does not overshadow or take too much time away from the central purpose of the seed fair: farmer-to-farmer seed and information exchange. Seed fairs must be held when farmers have planting seed stored: after harvest and before their main planting. Our early surveys during the planting season revealed very little seed in village homes, so a seed fair would have little to exchange. We also scheduled the fairs to be held on the mornings of non-holiday times, when villagers would have time to participate. If you expect schoolgoing youth, women, and people of different ethic/religious groups to attend, be sure to plan the fair for times when those people are available. 4) Invite participants and discuss with them what types of seeds to bring. We invited people who had participated in interviews about their local seed system. In our region, small quantities of vegetable seed are freely given without expectation of payment or return in seed or produce. We discussed with farmers the purpose of the seed fair, and emphasized that this was a time to showcase and to share about their special and unusual plant varieties. We reminded them that our activity focused specifically on local vegetable varieties, not on staple grain crops. We also specified that farmers should not bring seeds that are already commercially available or hybrids. Despite these explanations, some farmers did bring packets of hybrid maize, or local rice varieties, but nearly all of these packets were not taken by farmers, and were simply left on the tables at the end of the seed fair--apparently less interesting to the other farmers than the beans and other vegetable varieties present. 5) Distribute empty seed packets to be filled by participating farmers ahead of time. In our first seed swap among agriculture NGO staff, people brought seeds in bulk; after everyone heard about the varieties from the people who brought the seeds and signed up for the seeds of interest, we divided all the available seed into that number of packets at the meeting. This took a lot of time at the event, so after that we distributed small sealable medicine bags to participants when we invited them to the seed fair, so they could portion out ahead of time the seed they intended to share at the fair. We attached blank labels to the bags with space to write the farmer's name, location, month/year of harvest, type of seed, and any special characteristics of this variety. Giving a unique number to each bag ahead of time (labeled with a permanent marker directly on the bag) made it easier to record the seed data at the seed fair. In order to ensure sufficient seed for a trial, we asked farmers to include in each packet a minimum of 20 seeds for large seeds (like beans), and a teaspoonful for small seeds. Giving invitations while distributing seed packets made the women farmers' expected participation clear. 6) Decide and specify what information you will collect. Seed fairs are a chance for farmers to learn from each other, but the event also provides an opportunity for your organization to learn more about farmer varieties, seed practices, and challenges or limitations that farmers face concerning seed supplies. You will have the chance to hear about farmers' priorities regarding a certain crop, and the unique features of their different local varieties. Listen carefully as they describe how they select and process seed. Do they experience their planting seed supply as a scarce and uncertain resource, or as abundant and non-limiting within their agricultural systems? If information gathering is one of your objectives, ensure that your data collection goals can support, rather than interfere with, farmer seed exchange. Decide what information you will need, and ensure from the outset that you can gather and store that information in an organized way. Specify what information you want to gather ahead of time, and develop a written form and other methods (such as photos of farmers with their numbered packets, or close-up photos of individual packet labels) for recording that information for each seed lot farmers bring. Note each farmer's name and location in case someone wants to contact a farmer for additional seed or information later. For each packet of seeds, collect the local crop and variety names, growing region, time of harvest, and any special characteristics of the variety (unusual color, size, early/late harvest, perennial growth, taste, storage qualities, cooking characteristics, production needs, etc.). Collect only the data you need, using a simple form; time is limited, and a form that is too complex with unnecessary data will take too long and may not be useful if only partially filled out. Include an open-ended question such as "What is the best or special feature of this variety?" 7) Decide whether you will collect data about the farmer varieties before or at the beginning of the seed fair. Your organization may be hosting these seed fairs in part to learn more and to gather information about local plant varieties, or to identify outstanding or unique local plant types. At each of our seed fairs, this proved challenging, because of the diversity of information given and the long time needed to write that information. We limited the number of seed fair participants in part because the time to collect information about each seed lot brought to the seed fair proved to be quite long. With farmers' limited literacy, we relied on many assistants to communicate in the local languages and to write the farmers' information about the seeds in the national language, beginning immediately as farmers arrived for the meeting. Even using a streamlined form, it took seven local facilitators more than two hours to record basic information on the seeds brought by thirty farmers. It was good to have welcome refreshments available during this extended arrival/registration period. We recommend that you try to record some of the information ahead of time if possible, visiting some of the participating households the day before the fair. Otherwise, we found that it worked best to have as many facilitators as possible available to register participants as they arrived-at least one recorder-facilitator for each 5 farmers you invite-to complete this process in a timely way. We also held brief exit interviews with farmers as they left the event, to determine whether they actually exchanged the seeds they brought and had new varieties to take home. The seed variety information should be recorded in at least two places: on the seed packet, so the recipient can know the variety's origin; and on separate data sheets kept as a record by the host organization. Dual recording adds time to the process and having a system set up to expedite this is important. Ahead of time, seed fair staff arranged for registration snacks and drinks, and lunch together, featuring some local foods that were the subject of the seed exchange, after the event. Ordering the meeting, discussions, and logistics of the actual seed swap requires good organization; having a local event coordinator run the day's program was essential. Assigning specific roles (e.g., data collectors, local language translators, speakers, and discussion group facilitators) to the individuals involved in the seed fair made the event run more smoothly. Incorporating local cultural elements related to seedsaving and biodiversity, including songs or drama about seedsaving or local agriculture, will also increase farmer interest and learning. Organizers should pay attention to how the program sets the tone for the seed fair: a formal meeting, a participatory gathering, or a festival event. Decide whether and how you might include invited guest speakers' speeches, presentations by groups of farmers from different regions, music, or other aspects that will support your purposes for the event. 10) The main events: Farmer discussions and presentations of their varieties. 11) Plan the seed exchange. Scheduled informal discussion and seed viewing time increased farmer-to-farmer interaction. Farmers were able to ask other farmers directly any questions they had about the varieties they brought. 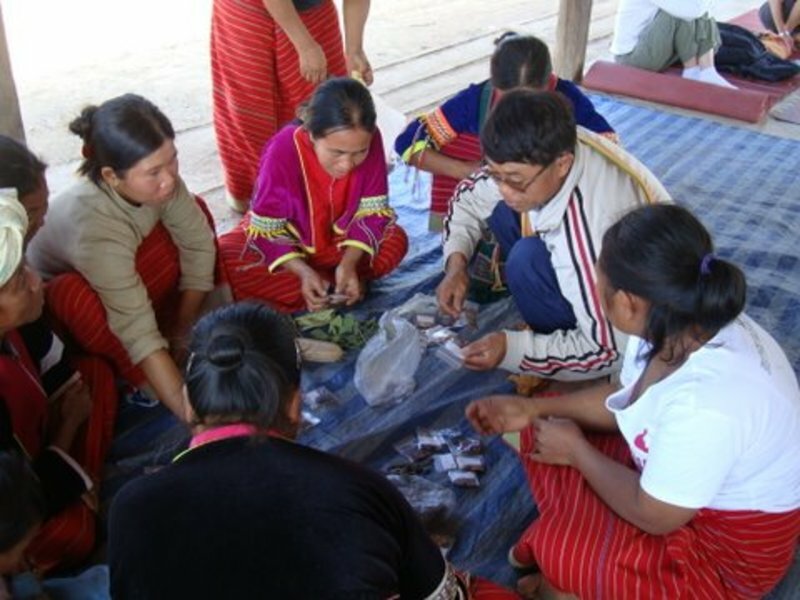 Following local custom of sharing small seed quantities without expectation of payment, our seed fairs practiced free packet-forpacket exchange among farmers. For examples of seed swaps on a much larger scale that use different means to facilitate exchange, read about "Seedy Sundays" in the UK ( http://www.seedysunday.org), the Navdanya seed-sharing network ( http://www.navdanya.org/earth-democracy/seedsovereignty), and the GREEN Foundation work with community seed banks in India. Consider how any seeds the organizers distribute may impact the extent of farmer exchange. At one seed fair, ECHO brought promising seeds of interest from the Thailand seed bank, which farmers sought at the same time as the farmer-to-farmer exchange was happening. Farmers' eagerness to receive the packaged seeds (which they may have perceived as more novel or valuable than their own seed stocks) meant that they abandoned their own seed swapping in the interest of choosing packets of the seed bank seeds, which essentially ended the local-level exchange too early. In subsequent seed fairs, all farmers received diverse "gift bags" of seed bank seeds at the fair's conclusion, so this seed distribution did not limit farmer exchange. 12) Process seed fair data and follow up with communities involved. As soon as the event has ended, your organization should review the staff notes from the discussion time, and discuss ways to improve your next seed fair. Organizations with ongoing presence in the seed fair regions can follow up on issues, decisions, and farmer concerns or initiatives brought up during the seed fair. Farmers may identify certain local species they want to conserve, or offer ideas on how to form community-based seed banks, or propose local trials of different varieties. Ask those who attended if they planted the new seeds they obtained, how they grew, and what the farmers learned most from the seed fairs or would like to see at a future event. Farmers and agricultural organizations enjoyed the events, and the chance to talk about and to value their existing vegetable production. 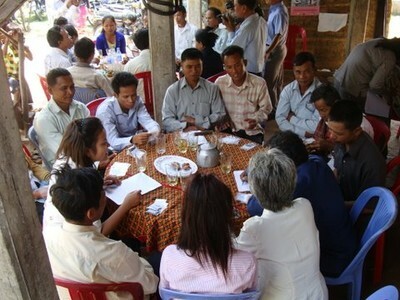 NGO staff and villagers had opportunities to discuss local seed issues and ideas for how they might work together to strengthen the local seed system. Local organizations also gave input regarding their priorities for the ECHO-Asia seed bank. In all cases, even experienced agricultural development workers and/or government officials were surprised by the existing diversity already present in the communities. 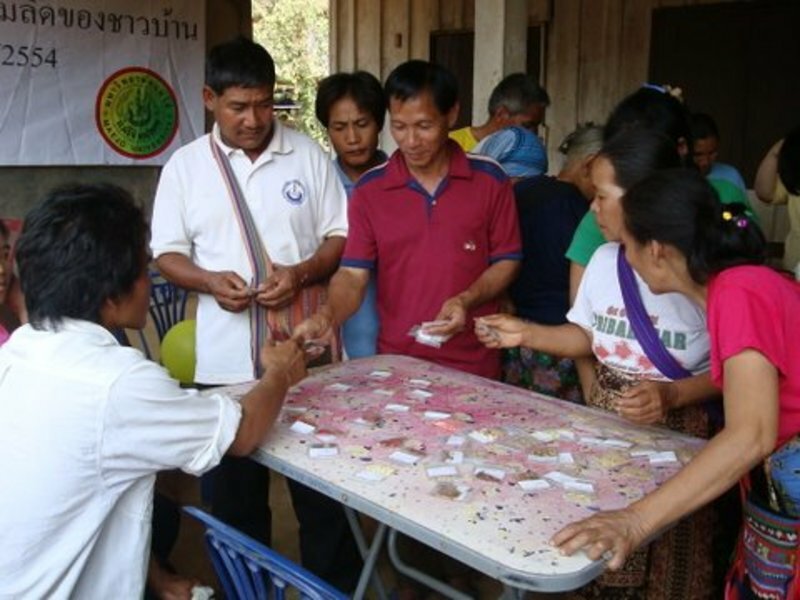 Seed fairs can be held at little extra cost if combined with other training events or meetings. Seed fairs also provide an opportunity for farmers to discuss how their own seed-saving practice links to their involvement with commercial agricultural systems. 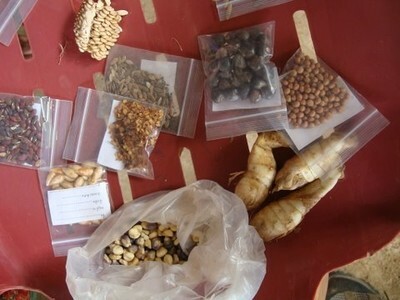 In our experience, farmers who primarily plant their own saved seed (Chiang Dao, Chiang Rai) brought a greater diversity of vegetable varieties to the seed fairs than farmers who have ready access to commercial seed (Cambodia). Farmer discussion groups at a seed fair could consider this aspect of their production. For example, they could ask the following questions: When and how did farmers make the transition from home-saved seeds to purchased seeds? Are there locally valuable varieties not available from commercial sources? Have they experienced shortages or losses in planting seed of certain varieties? What are the ways in which their communities can maintain seed stocks of the useful biodiversity present in their regions? They may discuss ways to access the commercial seeds they want more easily, as well as how they can strengthen their own local seed-saving practices. ECHO is very interested to be involved with groups planning farmer seed fairs. Please send us your additional insights, ideas, and experiences in ways to help farmers access crop varieties that perform well under local conditions. Two comprehensive, practical online resources from similar initiatives in Africa will give you additional ideas on organizing, promoting, and making the most of knowledge gained through your seed fairs. In Tanzania (FAO-LinKS Project 2006), multiple seed fairs were held with small groups of farmers (like those we describe here), clusters of farmer groups, and thousands of individual farmers. These included presentations by expert farmers who trained others on seed storage, oilseed extraction, and other topics. They recommend that seed fairs be held annually, and include cultural-entertainment components on agricultural biodiversity themes that will add interest, attract young people, and help participants learn the event's important messages in a memorable way. This document contains recommendations for conducting seed fairs and examples of data collection formats you can adapt. In Mozambique (Bakker and MartÃnez Mendoza 2009), a farmers' cooperative organization began with an annual, central seed fair and added regional fairs under local direction, which varied their locations to maximize participation. (2) The ECHO Asia Impact C enter conducted the India seed swap in partnership with NEICORD. The Thailand and Cambodia seed fairs were organized in partnership with Pennsylvania State University (USA), Mae Jo University (Thailand), and Wholistic Development Organization (Cambodia). The focus crops for this study consisted of primarily seed-propagated vegetables that are eaten as part of the main meal. This was meant to permit a focus on non-grain crops of high nutritional, ecological, and economic value. (3) For more on this, see "the Simplest Way to Control Bean Beetles" from ECHO at http://www.echonet.org/content/100cropSeed/758. Chart: A Summary of Seed Fairs Facilitated by ECHO Asia during 2010-2011-available via by clicking here.